We set our sights high with the understanding we might not get all the peaks... but our top performer got 8 SPS List peaks in 5 days. Not bad for late season with snow one afternoon! 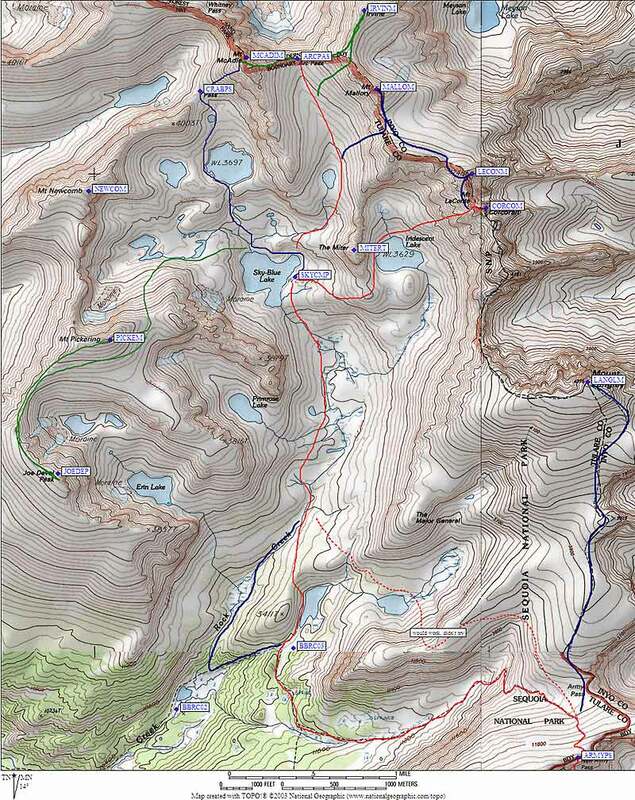 Click on this image for a map of our peaks and routes. 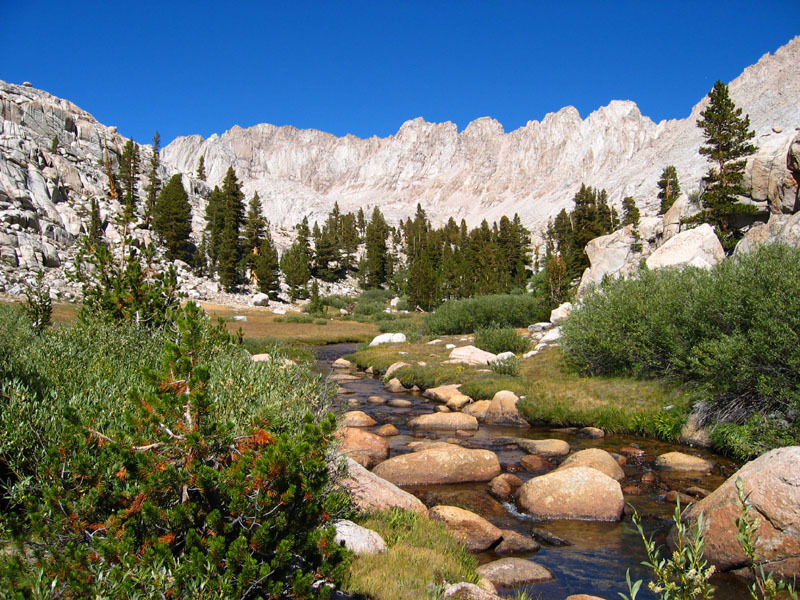 There is more than one trail to Soldier Lake (un-marked on the map, but there are clear trail signs), and more than one way to go up-canyon once you get there, but the terrain is all easy. 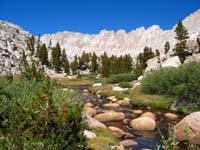 We went around the west lakeshore, scrambled up a steep but short slope, and side-hilled until Rock Creek was at our elevation. By late afternoon I was napping in the sun behind a windbreak at Sky Blue Lake. The wind shifted continually after that first evening, and it wasn't really warm again until the last day. Up at dawn on Friday, we headed up more easy terrain to Crabtree Pass, toward the Class 2 chute I had reported on an earlier trip. Several others have since verified that this proposed route works, but this was my first chance to actually do it. Very easy! 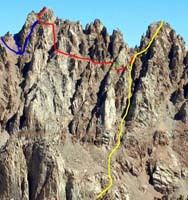 The obvious chute leads from Crabtree Pass directly to the notch between the north (high point) and middle (hard point) of McAdie. From the notch to the high point is straightforward, and we basked in the sun while watching clouds build over the Owens Valley. By Arc Pass I was worrying about the weather and thinking my lack of acclimatization might cause Linda and Daryn to miss Irvine, so I headed back down to camp. Sure enough, they got caught in a snowstorm on the summit while I jumped in my bivy bag and wondered if it would accumulate enough to be dangerously slick on the rocks. No problem. Soon they were back in camp and soon after that Lisa showed up (having hiked in a day later than the rest of us). The wind was relentless through dinner and through the night. With the weather in mind, we left camp shortly after dawn on Saturday, going over the shoulder of The Miter to Iridescent Lake. Imagine our surprise when we found ourselves 50 yards from a bighorn sheep! None of the ramps worked, and we had to go high (just above 12k) over the shoulder, so I'm sure the bighorn normally has this grass to himself. We skirted the lake, where I slipped on some ice and fell in a mud puddle, then debated just where to start up Corcoran. With my fleece pants wet and with a cold wind blowing, I decided my thin layer alone would be warmer. The fleece froze before I could lash it to my pack. Because of the early morning light, I didn't get a good picture... but from the north end of Iridescent Lake we angled up and south on the main grassy ramp, turning up through the cliff band about where the green started to thin out. We were aiming for the deep chute between two somewhat triangular flat-fronted buttresses, which when viewed from across the lake is the straight chute that leads directly up to the first saddle north of Corcoran. The two buttress ends are where the yellow line enters the chute about a third of the way up, but this picture was taken from a different angle (the shoulder of Pickering) so they don't look triangular in the picture. Secor's book says to take the right branch twice near the top, but we didn't see any branches to take. We did a few Class 3 moves early on while heading up the chute but it was mostly Class 2. There was a minor, narrow side-chute Daryn investigated early on - but it seemed too difficult for Class 3 and he couldn't quite tell if it kept going. It confused us because of Secor's 'follow chutes to the right' description, but we ignored it. Secor also talks about going under a huge chockstone, but we didn't see that either. Then there's the "much loose rock" warning, but we didn't think it was bad at all. Perhaps we weren't on the described route, in which case ours was better! Page 46 of Secor's book seems to show a line left our chute, but I can't be sure. 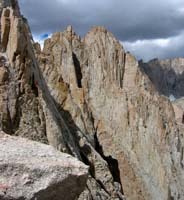 We just climbed straight up the same chute until within 50' of the saddle north of Corcoran, then angled right below a face (now 300' below the summit), and climbed Class 2-3 straight to the summit. No tricks. No dangerous loose rocks. 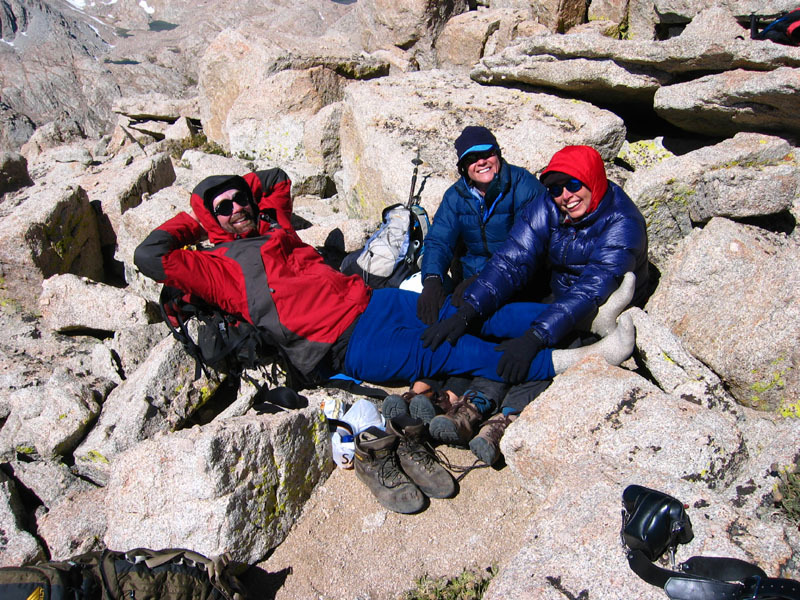 Corcoran's summit was blustery, but much warmer than the shaded chute. Fearing my fleece pants would never dry out, I put them on while they were still frozen stiff. Yikes! Huddled between the rocks, in the sun but not warm, Linda and Lisa offered to help thaw me out. Daryn just took the picture. If you're traversing from Corcoran to LeConte, come back down to just below the notch north of Corcoran, then start angling north as you drop another 200'. Don't drop too far! If you're doing it right, you'll cross into another chute immediately above a very distinctive cleaver with two windows in it. This cleaver is the right green section on the route lines picture above. That flat sunlit section at the left of the picture above is where you cross out of the chute we climbed as you start the traverse to LeConte, the right green section on the route lines picture above. We made a significant route mistake here, continuing DOWN this next chute looking for ducks where the traverse continued. About 200' down the climbing got harder and we turned back up to search for the way out. The way out is not obvious. You have to climb directly up a narrow chute (almost a chimney) north of the window cleaver and about at the same elevation. 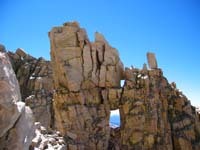 This chimney is the left green portion of the route lines picture above, and is about 500' below the summit of Corcoran. 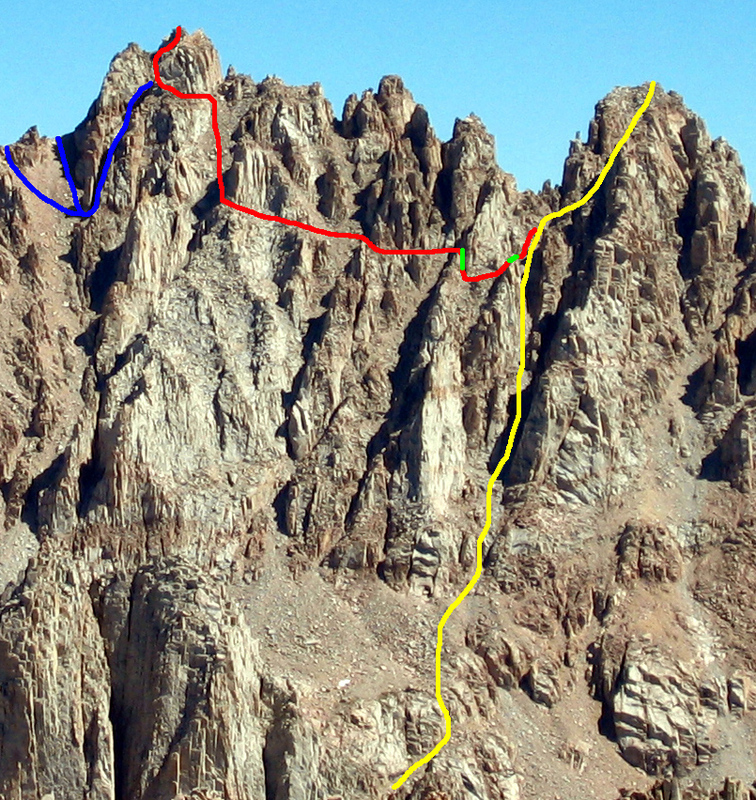 We continued the traverse to LeConte, as close as I can tell, on the red line shown above. You may notice this does NOT seem to match the line on Page 46 of Secor's book but that may be because the pictures are taken from different places. Daryn and I put some effort into getting the route lines right on my picture, but mistakes can be made! I remembered from a previous trip that the Waterfall was OK to climb, but I wanted a rope to descend. This time we were going down without the benefit of having climbed it first, and we used 80' of light static line to rappel. Once again I cut off the old deteriorated slings, but this time I flipped our rap sling off the rock and left the route clean. But wait, there's more! We jaunted over to Mallory before returning to camp via the sandy slope below Arc Pass. This was our longest day at almost 12 hours but it was by far the most fun. These two loop excursions were way better than the standard up-and-back. We braved the wind for a while, but turned in early under clear cold skies. Yesterday's snow storm was a quick fluke. Is it Sunday yet? We trudged up boulders and sand to Pickering, then over to Joe Devel. 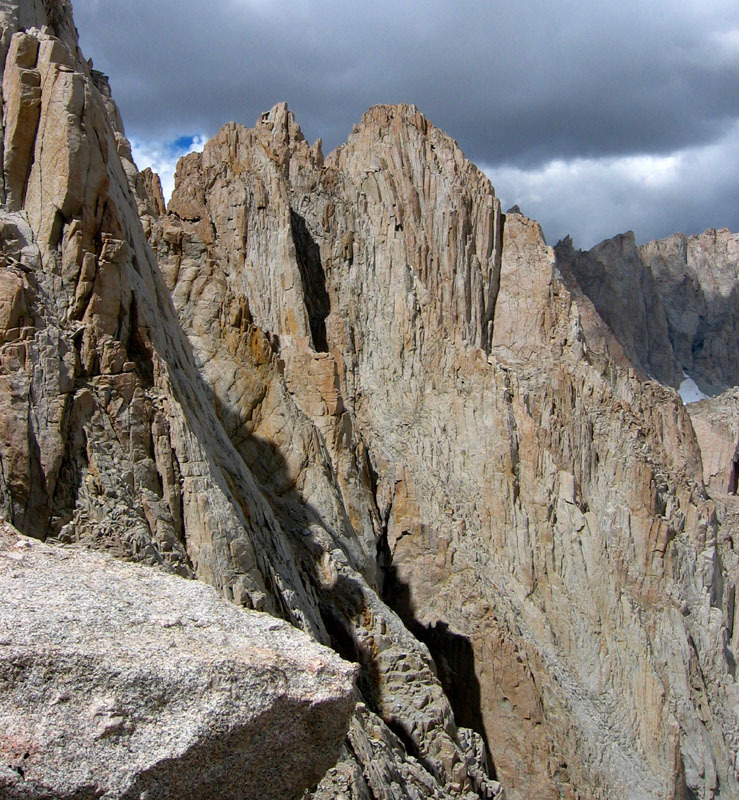 After the great climbing and the long day on Saturday, we abandoned our wild thoughts of doing Chamberlin and Newcomb the same day, and went back to camp a bit early. Lisa hiked partway out so she could make her flight the next day, I jumped in the lake, and we finally had a break from the wind. Monday we started early but wasted a bit of time following the horse trail down Rock Creek all the way to the main trail rather than traversing past Soldier Lake. At the time it seemed inefficient, but the walking sure was easy and we made good time. There was a buck showing off for the ladies, mock fighting with a branch. Very odd. Daryn split off for a 2-hour blitz of Langley, Linda and I hiked on and debated land use policies, and all too soon we were in Lone Pine eating Mexican food. Some of the best climbing is to be had AFTER Labor Day!